Rutted and bumpy four-kilometre approach road from Amritsar-Lahore Marg takes you to the ancient village, Bhakna, believed to be as old as Amritsar city itself. 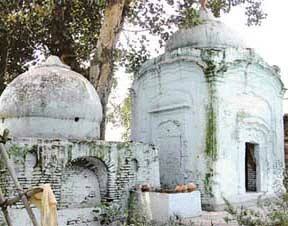 Bhakna is the ancestral village of Baba Sohan Singh Bhakna, founder-President of the Ghadar Party. Balle-balle from Amritsar to L.A. The holy city of Amritsar, which is beaming on the world map due to its religious, historical and rich heritage, is many a time meted out step-motherly treatment. This allegation by city residents simply shows the resentment prevailing among them, as the city is deprived of many facilities on the pretext of it being a border district. Residents and factory workers at Bhai Manj Road area in the historic Sultanwind town near here are forced to live in unhygienic and unsanitary condition. The problem has worsened as the solitary drain has been encroached upon by some residents, resulting in inundation of road with filthy water released from houses and dairies. Even as the municipal corporation continues to “slumber over” its duties, residents here have encroached upon roads to extend their houses’ boundaries. In a significant development which would trigger accelerated economic development, the Ministry of Finance recently notified the Rajasansi International Airport for export and import. Despite the clearance of the Durgiana Mandir model in 2001 by the railway authorities, the model has not yet been installed at the local railway station. City students have brought laurels to their respective colleges by securing top positions in Guru Nanak Dev University. “Azaad Hindustan”, a book written by Mr Aman Sharma, a government employee, is an effort to jolt out of complacency the youth of the country who have forgotten the incomparable sacrifices of freedom fighters and their own responsibilities towards the nation. In Ruins: Ancestral house of Baba Bhakna (seen in photograph) has been demolished to make way for a modern building. The village, once a centre of higher learning, was also called Kashi in the olden days. Famous pandits from all over the sub-continent used to visit Bhakna for discourses. The magnificent ancient Krishna Temple in the village, made with Nanakshahi bricks, which find mention in the Punjabi folk songs, is considered enough proof of its historicity. However, the ancestral village which is only seven kilometers (crow fly) from the Pakistani border seems to have been forsaken by the district administration and state as well. The historical but neglected village, which is known for being a harbinger of freedom movement, could not witness any development after independence. The tall claims made by the then Chief Ministers Partap Singh Kairon, Beant Singh and Parkash Singh Badal notwithstanding, the village is a classic example of “neglected countryside” in independent India. Ram Lubhaya Sharma, a retired teacher and president, Baba Sohan Singh Bhakna Memorial Committee, said the village was named after one of the seven bothers, born in the area. The names of other brothers were Khasa and Cheecha (both villages bearing these names are few kilometres from Bhakna). The border village had a good Hindu population of all castes that witnessed large-scale migration during the heydays of militancy. The village had a bustling bazaar — a great attraction for adjoining villages, before it was hit hard by militancy. Incredibly, the village has produced more than 300 teachers who have excelled in the field of education. Credit for making Bhakna as one of the most educated villages of the state goes to Baba Bhakna who had made special efforts in this regard throughout his life. Even in his old age, Baba Bhakna would impart education to the wards of freedom fighters, providing them boarding and lodging in the village itself. The villagers claim that Bhakna village was once devastated during the olden days and the “theh” (big mound) on the outskirts is a testimony to this theory. Unlike Ucha Pind Sanghol, archeological department has failed to carry out any excavation of the big mound to establish its prehistoric civilisation. It is believed that after the large-scale destruction, the Bhakna village was moved to the adjoining plains. The beautiful frescos in the ancient Hindu temple in this border village stand damaged, thanks to the indifferent approach of its caretakers. The magnificent talab (holy tank), made of Nanakshahi bricks, is also in bad shape. The temple complex, made of Nanakshahi bricks, houses Shiva, Krishna, Sandhu and Hanuman temples. It has been whitewashed from inside and outside without caring about its heritage importance. The name of this historical temple also finds mention in the Punjabi folk songs. The temple was considered a great landmark in the border belt. The temple complex also houses the religious place, believed to have been constructed in the memory of Kala Mehar, ancestor of Sandhus. Shockingly, the idols of Krishna, Hanuman and other gods and goddesses have been freshly painted. The publicity material written on the outer wall of the structure is an eyesore. The village is a true example of “unity in diversity”. Even as ten million people, including Hindus, Muslims and Sikhs, were massacred during the communal frenzy at the time of Partition, Baba Sohan Singh Bhakna formed Aman Sabhas (Peace Committees) and helped to send many Muslims safely to the newly-created Pakistan. Baba Bhakna died as a disappointed man at the age of 98. Mr Hazara Singh Gill, grandson of Baba Bhakna, said that he was shocked to see the thin gathering at the shardhanjli samaroh of Kartar Singh Sarabha. He claimed that on his return from village Sarabha, Baba Bhakna said that he had never dreamt such “independence”. Mr Rupinder Singh, an activist of Naujwan Sabha, says Baba Bhakna fell ill after the shardhanjli samaroh and died in the local government hospital on December 21, 1968. Though the local administration had offered him a special ward in the hospital, he had declined the offer. At one time the then Chief Minister, Partap Singh, had offered him a palatial house at Shimla, but it was not accepted by the great freedom fighter. Baba Sohan Singh Bhakna, who had played a significant role to make his country free from the yoke of slavery, had to go to jail even after independence. He was of the view that “complete independence” was yet to be achieved. He was among those sentenced to death along with Kartar Singh Sarabha. However, timely legal help provided by Pt Motilal Nehru saved him from being hanged a day before the actual hanging. During the British rule, he faced inhuman torture in various jails of the country. The Cellular Jail located in Port Blair, where Baba Bhakna was kept, was a mute witness to the tortures meted out to the freedom fighters, who were incarcerated in this jail. Baba Bhakna and other freedom fighters were kept in fetters and they had snakes, leeches and scorpions as their companions. The food that was given was not fit for human consumption and Baba Bhakna had to observe fast in protest against this many times. The guards would indulge in physical torture and flogging. This freedom fighter spent the best period of his life, 26 years, in some of the worst jails of the country. 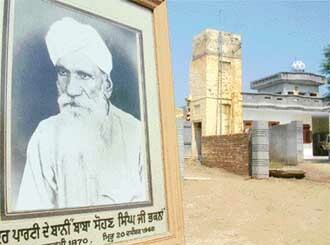 Baba Bhakna, who kick-started the Ghadar Movement, was born in January, 1870, at Khutral Khurd village, Amritsar. Sohan (later became famous as Baba Bhakna) was the only son of Karam Singh (a resident of Bhakna), a well-to-do peasant who died when Sohan was hardly a year old. Sohan Singh migrated to the USA in the year 1907and joined the Punjabi immigrants in California. In course of time, the miseries and hardships suffered by Indians there made him an ardent nationalist. As there was no school in the village, Sohan Singh received his early education at the local gurdwara. Later, he opened a school named Janta School in his village in 1953 and villagers were persuaded to send their daughters to the school. However, Janta School could not be preserved in its original form after it was taken over by the state government. While carrying out expansion of the building, old trees were felled and the major part of the structure was demolished to pave way for the modern building. Wedded to the ideals of socialism till the end, he had marked sympathies for communism. But he was never dogmatic in his approach. Mr Jasbir Singh Jass, general secretary, Baba Bhakna Memorial Committee, said that despite the fact that Baba Bhakna was a prominent leader of the CPI, he had played a significant role in bringing about rapprochement between the two warring groups of the SGPC. Installing of FM radio station is one such facility, which has been denied by the government for the last many years. A number of organisations and individuals had written to Information and Broadcasting Ministry to install an FM radio station here but in vain. Several of them, however, did get a written assurance and promise in response. The government’s recent decision to establish 330 new FM radio stations in 90 cities all over the country has brought some hope to the city residents. The cabinet approved a proposal to allow 20 per cent foreign direct investment in the private FM radio sector in this regard. Amritsar once had a medium wave radio station in the 1960s. After the success of Satellite Instructional Television Experiment (SITE) in the early 1970s, first TV station of north India was also established, which was inaugurated by former Prime Minister Indira Gandhi from the vast quadrangle of the local Khalsa College. Regular programme used to be beamed for the benefit of the people of the border area. But all that is now a thing of the past. The radio station and the TV studio were shifted to Jalandhar. Besides All India Radio, the city is getting only primary channel from Jalandhar, which does not have any entertainment programmes. The neighbouring district of Jalandhar has the facility of FM radio, but it has only 40-60 kilometers range, besides having Vividh Bharti Channel which also does not reach Amritsar. In the absence of radio station in the holy city, the residents of the border area easily receive programmes from across the border more clearly than those received from Jalandhar or Jammu, exposing them to false and virulent propaganda reportedly being beamed by Pakistani radio channels. The Pakistani radio channels — Lahore-I and Lahore-II — can easily be listened to at the border belt of Amritsar, Gurdaspur and Ferozepore. Mr Sandeep Kumar Sharma, a lecturer in the local DAV College and radio buff, had got a letter about two years back from Mr S. K. Srivastva, the then Assistant Director, Engineering Planning and Development unit of the Prasar Bharti Broadcasting Corporation of India, informing him that the ministry was planning to install an FM radio station there. The letter from the Prasar Bharti had stated that a scheme for the installation of the FM radio station at Amritsar was being considered in the draft 10th plan, subject to the availability of resources. Dr Charanjit Singh Gumtala, president, Amritsar Vikas Manch (AVM), while welcoming the government’s move to install 330 new FM radio stations, said the installation of an FM radio station would provide an opportunity to connect the masses with the local authorities more effectively. Mr Sandeep Kumar has recently been awarded the Smart Technology Award for his contribution to the field of radio. His fascination for radio started when his mother gifted him a radio set in 1990. He used to listen to radio for eight to nine hours daily. He also presented his programmes on radio. In 1995, he participated in Tarana and various other debate programmes. He still writes regularly to aapki farmaish, geeto bhari kahani, sangeet.com and ek hi film se. He played a major role in taking “computer-revolution” to people through radio. He started various shows on computer and that too in Punjabi language. “Samart Computer and Samart Technology” is one such programme started by him. He said it was very challenging, as all books available and notes related to computer learning were in English and the translation was difficult. He said the authorities had helped him to make his programmes a success. Residents and factory workers at Bhai Manj Road area in the historic Sultanwind town near here are forced to live in unhygienic and unsanitary condition. The problem has worsened as the solitary drain has been encroached upon by some residents, resulting in inundation of road with filthy water released from houses and dairies. This water enters the low-lying houses and a fifty-year-old factory located in the area. Mr J.S. Sokhey, managing director of the factory, rued that panchayats and municipal corporation (MC) were unable to maintain the drain. He said the drain had become almost non-existent when some residents of the area occupied it for their personal use. He said filthy water remained stagnant on the road and it provided a breeding ground for mosquitoes, thereby increasing the fear of epidemic. “Even a single shower of rain spells doom for the locality, as we have to wade through water to reach our destinations,” says a resident of the area. Over ten houses are located in the street. The situation is compounded with the release of refuse of livestock from dairies located in the area. Sultanwind village existed well before the city was inhabited. Now, it has become a town. It was incorporated in the municipal corporation limit about 30 years back. “But municipal corporation taking over has not made much difference to us,” allege area residents. The area residents have written about their problems to municipal corporation authorities, but to no avail. When contacted, a senior official of the municipal corporation said they had received the complaint. He said the problem required enormous funds. He said not only drains, but also ponds in the town had been occupied illegally. He added that all sewerage systems falling in the periphery of canals, including Sultanwind, would come under the proposed Guru Ram Das Project worth over Rs 250 crore. In the majority of posh areas and colonies, the land meant for footpaths or road extension has been taken over by residents. The modus operandi is similar in most cases. First, the front portion outside main house wall is enclosed with an ornate grill. The enclosed portion is beautified with flowers and ornamental plants. In some cases professional landscaping is also done to beautify it. The owner waits for opportune time to remove the grill gradually and replace it with brick wall. To hide the newness, the wall is whitewashed the same day to match with sidewalls of the house. The inner main wall is kept intact for considerable time to “tide over” the new look or the neighbour’s complaints. Gradually, the inner main wall is shortened, as a precautionary measure and proof in case of any explanation call by the municipal corporation authorities. Finally, the inner wall is removed and the residents have a bigger garden or garage space for free! Although some term it as “negligence” of the corporation, yet insiders allege that the encroachments are impossible without the connivance of some top municipal corporation officials. The building inspectors, in nexus with senior corporation officials, allegedly take bribes to ensure that the construction is carried out without any hitch. “The area building-inspector also keeps an application by builder to MC handy in case of surprise survey in his area. This is done to save his own skin,” alleges an insider. Recently, BJP District President, Mr Bakshi Ram Arora, also former chairman of the Improvement Trust, had written a complaint to the Minister of Local Bodies about the growing menace of such encroachments. He had highlighted an encroachment on Dasondha Singh Road where construction was going on and had underlined the fact that the road was already 40 feet in breadth and was proposed to be extended to 60 feet as per the requirements of the commercial area. Mr Bakshi had pointed out that the extension of the houseline was not only a violation but it would also narrow down the road further, making the portion a virtual “traffic bottleneck”. Mostly these types of encroachments take place in posh colonies like Green Avenue, Kennedy Avenue, where the prices of land are skyrocketing at a rapid pace and residents have only limited area for garden space. “Ideally, good citizens would complain against such violations that tamper with building bylaws, but here a neighbour takes it as an opportunity to slyly make the same moves to extend his houseline,” says a city resident. Notwithstanding that the encroachment on Dasondha Singh Road was promptly razed, thousands of such encroachments continue to flourish without any action from authorities. Corporation officials admit that there is no proposal to streamline houselines in keeping with building and town-planning. There is no proposed drive to clear encroachments or to prevent roads from being squeezed, they add. Municipal Town Planner, Mr Hemant Batra, when contacted, assured that action would be taken against violators. The industrial, trading and exporters’ associations had persistently been urging the Central government to notify the airport to facilitate hassle-free import and export and also to avail of various export benefits which otherwise remained out of reach of exporters. Welcoming the notification, the chairman, CII, local zone, Mr Gunbir Singh, expressed the hope that very soon curries of Punjab, along with a wide range of food and vegetable varieties, would be exported out of Amritsar, taking advantage of large number of international flights available for various destinations. He added that the notification would give thrust to agricultural trade. Mr Gunbir Singh hoped that the exporters would make optimum use of the potential available at the airport and make it a viable commercial entity. He said a number of international flight operators, including charter flights, were interested in using this airport for in-bound and out-bound cargo. The move was also welcomed by the general secretary of the Shawl Club, Mr Pyare Lal Seth, and the vice-president of the All India Rice Exporters’ Association, Mr K.R.S. Sobti. Confirming the notification, director, Airport, Mr V.S. Mulekar, pointed out that certain formalities for handing over the custodianship from the department of customs to the cargo handling agents needed to be sorted out. A large cargo complex had already been completed and made available for operation. He said that the notification would greatly benefit the local exporters and importers as they would be able to avail of various benefits, including duty drawbacks and DEPB facilities. Meanwhile, Mr Mulekar invited a meeting of leading exporters of Punjab to give them information about the notification and persuade them to use the existing cargo facilities to enhance their export potential. Mr Raj Kumar Agarwal, an architect and engineer, under whose supervision the model was made way back in 1994, said that first the railway authorities took seven years to grant permission to the Durgiana Committee to install the model of the temple. The model of the temple, which is 3’5’’x 4’6’’x 1’3’’ in size, is made of acrylic, plastic sheet and balsa wood. The doors of the main entrance and the temple are made of silver. Mr Agarwal, who belongs to the family of freedom fighters, gave the final touches to the model after it was prepared by the skilled craftsmen from Delhi under his supervision and guidance. The dome and the pillars at the top are depicted as gold plated. The bridge, connecting the main entrance and the temple, the marble flooring, the sarovar, the electric poles lining both sides of the bridge show how well the craftsmen, under Mr Agarwal’s guidance, have taken care of all minute details. Mr Agarwal likes to make models of historical and religious buildings. He made the model of Jallianwala Bagh that has been installed at the railway station. He has also made the models of New Amritsar Cantonment, Galiara scheme around the Golden Temple. 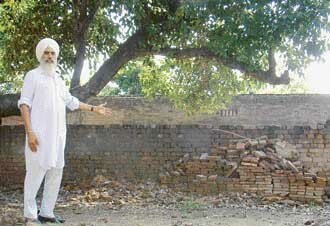 Besides, he has designed a number of government and private buildings, including Khalsa College International School for Girls, Punjab Financial Corporation building, Indian Airlines Staff Housing Colony, R.D Khosla Senior Secondary School building (community hall), Batala, Sacred Heart School building, Chogawan. Apart from making models, he loves to do scale paintings. His painting of Jallianwala Bagh massacre has been displayed in the chamber of Punjab Vidhan Sabha speaker, Chandigarh. Shweta Bakshi from DAV College, Hathi Gate, topped in MA (English) Part II by securing 533 marks out of 800. She had bagged the first position in MA Part I last year. Kanu Bhushan from the same college stood third in MA (English) Part II, securing 508 marks. She had got the seventh place in MA Part I.
Smriti Mahajan and Sukhdeep Kaur Bal from the same college bagged joint fifth position in MA Part II. Earlier, Anoop Kalia from the same college secured ninth rank in the PMET test conducted by Guru Nanak Dev University. Chitwan and Shilpa Kapoor from the BBK DAV College for Women got the first and the second positions, respectively, in BA (Hons) English Part I. Shikha Sharma stood second in BA (Hons) English Part II, while Samartha Shori got second position in BA (Hons) English Part III. Vishakha Mehra from the same college got second place in M Com Part I. Shivam Sahni from Hindu College got ninth rank in the university in the PMET. Besides, he got 16th rank in the All India Manipal Entrance Test. According to Mr Sharma, he has also tried to pay tributes to hundreds of those freedom fighters whose lives could not find a mention in books. The writer has successfully weaved into the book various famous incidents of the freedom struggle. He does not follow a particular style. His style can be described as a mix of story, drama and one-act play. His writing is simple and easily understandable. He says it took him one and a half years of research to collect the facts and then interlace them with imagination. He adds that he wants to tell people to work for the country. He says various problems like corruption, moribund political system and neglect of humankind stirred him to write this book and once again bring forward the sacrifices of freedom fighters who had dreamt of a different India. The BBK DAV College for Women here won the maximum number of prizes in the recently concluded hiking and trekking camp, 2005, at Dalhousie. Nine students from the college took part in the camp, securing five prizes. Ninety students from 13 colleges participated in the camp. BBK College students who won first positions included Nidhi Sharma (best camper award), Radhika (best disciplined and all-rounder student). Priyanka Ahuja and Nidhi Sharma won jointly the first place in debate. Nupur, Neha, Ritu, Silky, Shruti, Manpreet, Nidhi and Manpreet bagged second position in skit. Appointment: Prof Baldev Sachdeva was appointed president of the Rotary Club, Amritsar Mid-Town, on July 8. A function was held under the chairmanship of Mr S.P. Sethi, district governor, Rotary Club. As many as seven toppers from Guru Nanak Dev University were honoured on the occasion. A sum of Rs 31000 was given to the Rotary Central to buy medicines. Earlier, during the 72nd Installation Ceremony of the local Rotary Club, Dr Narinder Singh was appointed as its president. The function was held a week back. Mr Tarlochan Singh, Chairman, National Commission for Minorities, was the chief guest. Inauguration: Mr Sunil Dutti, Mayor, inaugurated various developmental works in the city on July 10. He inaugurated the laying of concrete road worth Rs 4.40 lakh in Guru Nanak Nagar of Chheharta. 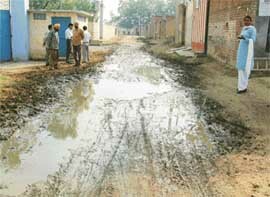 He said that out-of-order sewerage pipes in Dashmesh Avenue of B-Block would be replaced.